Milo Ventimiglia Talks Old Man Jack in "This Is Us"
You don't know old man Jack. The This Is Us season two finale will not only feature a wedding, but it also has Jack (Milo Ventimiglia) Pearson seemingly alive and well with Rebecca (Mandy Moore ). How? Why? What? Huh? Oh, the tears! E! 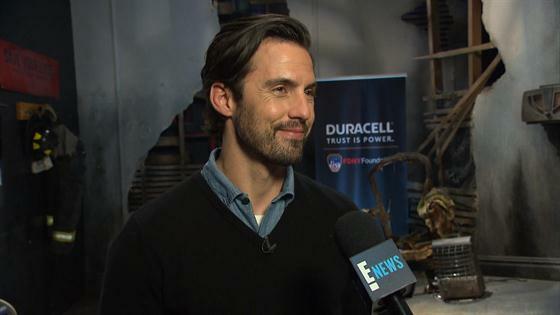 News spoke with Ventimiglia about what is sure to be an emotional This Is Us episode while he was working with Duracell to encourage folks to change the batteries in their smoke detectors in conjunction with daylight saving time (he knows a thing or two about the importance of working smoke detectors). "It's a side of Jack that we haven't seen. It's something I think a lot of the audience would have loved to see is this man in his 70s and we're hoping that it maybe softens the blow a little bit of the fact that he's not around anymore," Ventimiglia said about old man Jack. "But I think it's probably going to do the opposite and people are going to be a little upset, but what a fun opportunity," he admitted. Ventimiglia, who has previously teased an alternate reality episode of sorts, said he had seen Moore, Sterling K. Brown and Jon Huertas go through the aging makeup process and "I felt like I was definitely earning a stripe on a uniform to be able to go through the age makeup process and play Jack in his 70s." The Emmy nominee remained mum about whether or not viewers will see him share scenes with the actors who portray his adult children. Now that This Is Us revealed Jack's demise in the Super Bowl episode, Ventimiglia said he's looking forward to exploring more of how the character lived. "It's encouraging and exciting to know we get to explore a lot of different sides of him," he said. "Jack when he was younger and also the Jack we know: Jack in his 50s, Jack in his 40s, Jack in his 30s, maybe with the babies, maybe early courting of Jack and Rebecca when they first were dating. There's still a lot to see of this man and of this family and everyone. It's exciting. It honestly is the best job in the world." Click play on the video above to hear more from Ventimiglia. This Is Us season two ends Tuesday, March 13 at 9 p.m. on NBC.